The maize genome is divided among 10 chromosomes, and gene locations can be charted as genetic, physical, or cytological maps. The maize cytogenetic map is based on the pachytene stage chromosome karyotype that has been ruled by a fractional arm length unit currently referred to as centiMcClintocks (cMC). The cytogenetic map has many translocation breakpoint loci, but relatively few genetic markers (RFLP loci) to define those breakpoints. The mapping of markers that are shared among the three different maps will enhance the integrated view of the maize genome structure while creating new genetic and molecular tools for genome research and improvement. The Cytogenetic Map of Maize Project aims to produce a cytogenetic map of the entire maize genome using sorghum BACs as fluorescence in situ hybridization (FISH) probes on pachytene spreads. The goals of the project all involve using FISH to determine the cytogenetic locations of genetically mapped maize marker sequences. Specific aims of this project are (1) to develop a framework cytogenetic map with markers (CBMs) distributed at 10-20 cM intervals, (2) to develop a detailed map of maize chromosome 9, and (3) to map centromeric loci as an indirect method of locating the centromeres more precisely within the current linkage maps. The results will be integrated with other genome maps and released immediately into GenBank and MaizeGDB for public access. (2009) Birchler JA and Bass HW. "Part III, The Maize Genome, Cytogenetics and chromosomal structural diversity" in The Maize Handbook, (eds. JL Bennetzen and SC Hake); Springer. pp. 163-177. (2009) Murphy SP and Bass HW. "Meiotic Chromosome Behavior in Plants" in Plant Cytogenetics, Volume I: Genome Structure and Chromosome Function (eds. HW Bass and JA Birchler): Springer. (2009) Figueroa DM, Amarillo FE, and Bass HW. "Cytogenetic Mapping in Plants" in Plant Cytogenetics, Volume I: Genome Structure and Chromosome Function (eds. HW Bass and JA Birchler); Springer. HW Bass*, GL Koumbaris, & CJ Lawrence (POSTER) A Cytogenetic Map of Maize with Sorghum BAC FISH Probes. NSF Plant Genome Research Program Awardee Meeting, Arlington VA, September 18–21, 2003. CJ Lawrence*, GL Koumbaris, HW Bass, TE Seigrired, & V Brendel (POSTER B687) Cytogenetic Mapping and Cellular Localization Data Available at MaizeGDB. 43rd Annual Meeting of the American Society for Cell Biology, San Francisco, CA, December 13–17, 2003. HW Bass*, FE Amarillo, & CJ Lawrence (POSTER) Cytogenetic Mapping of Maize with Sorghum BAC FISH Probes 46th Maize Genetics Conference; Mexico City, Mexico; March 11–14, 2004. LK Anderson*, N Salameh, HW Bass, L Harper, WZ Cande, G Weber, & S Stack. (POSTER) Integrating genetic linkage maps with pachytene chromosome structure in maize. 46th Maize Genetics Conference; Mexico City, Mexico; March 11–14, 2004. HW Bass*, FE Amarillo, CJ Lawrence, & DM Figueroa (POSTER) A Cytogenetic Map of Maize with Sorghum BAC FISH Probes. NSF Plant Genome Research Program Awardee Meeting, Arlington VA, September 23-24, 2004. HW Bass*, MD Hay, RJ Hill, KA McLaughlin, CJ Hale, EH Jones, MS Conejo, K Graffius-Ashcraft, & K Onokpise (POSTER) The Maize-10-Maze project, a public field replica the maize pachytene karyotype, decorated with mutants. 47th Maize Genetics Conference; Lake Geneva, WI; March 10–13, 2005. DM Figueroa*, CL Strobel, BR Ring, & HW Bass (POSTER) Development of a Pachytene Cytogenetic FISH Map of the 90 Core Bin Marker Loci. 47th Maize Genetics Conference; Lake Geneva, WI; March 10–13, 2005. FE Amarillo*, CJ Lawrence, & HW Bass (POSTER) Construction of a High-Density Cytogenetic Map of Maize Chromosome 9. 47th Maize Genetics Conference; Lake Geneva, WI; March 10–13, 2005. HW Bass*, DM Figueroa, FE Amarillo, BC Ring, TE Seigfried, & CJ Lawrence (POSTER) A Cytogenetic Map of Maize in Oats with Sorghum BAC FISH Probes. NSF Plant Genome Research Program Awardee Meeting, Arlington VA, September 8-9, 2005. FE Amarillo* & HW Bass (TALK) Construction Of A High-Density Cytogenetic Map Of Maize Chromosome 9. Plant and Animal Genome XIV Conference; San Diego, CA; January 14-18, 2006. DM Figueroa, FE Amarillo, BC Ring, CE Strobel, CJ Lawrence, & HW Bass* (POSTER) A Cytogenetic Map Of Maize In Oat Addition Lines Using Sorghum BACs As FISH Probes. Plant and Animal Genome XIV Conference; San Diego, CA; January 14-18, 2006. CJ Lawrence*, FE Amarillo, TE Seigfried, HW Bass, & LK Anderson (POSTER) Predict Chromosomal Locations Of Genetically Mapped Loci In Maize Using The Morgan2McClintock Translator. Plant and Animal Genome XIV Conference; San Diego, CA; January 14-18, 2006. FE Amarillo*, HW Bass, & CJ Lawrence (POSTER) Construction of a High-Density Cytogenetic Map of Maize Chromosome 9 Using Sorghum BACs as FISH Probe. 48th Maize Genetics Conference; Asilomar Conference Grounds, Pacific Grove, CA March 9–12, 2006. DM Figueroa*, FE Amarillo, BC Ring, CL Strobel, CJ Lawrence, & HW Bass (POSTER) Constructing a Cytogenetic Map of Maize Core Bin Markers in Oat Addition Lines Using Sorghum BACs as FISH Probes. 48th Maize Genetics Conference; Asilomar Conference Grounds, Pacific Grove, CA March 9–12, 2006. CJ Lawrence*, TE Seigfried, LK Anderson, FE Amarillo, HW Bass (POSTER) Predicting Chromosomal Locations of Genetically Mapped Loci in Maize Using the Morgan2McClintock Translator. 48th Maize Genetics Conference; Asilomar Conference Grounds, Pacific Grove, CA March 9–12, 2006. R Okagaki*, M Jacobs, M Schneerman, R Kynast, E Buescher, FE Amarillo, CJ Lawrence, A Stec, T Kamps, C Chase, HW Rines, D Weber, HW Bass, & Phillips (POSTER) A Comparison of Centromere Mapping Techniques. 48th Maize Genetics Conference; Asilomar Conference Grounds, Pacific Grove, CA March 9–12, 2006. HW Bass*, FE Amarillo, DM Figueroa, BC Ring, AT Morganti, NC Fredette, JD Davis, & CJ Lawrence (POSTER) A Cytogenetic Map of Maize with Sorghum BAC FISH Probes. NSF Plant Genome Research Program Awardee Meeting; Arlington VA, September 7–8, 2006. KD Beckham*, DM Figueroa, FE Amarillo, CJ Lawrence, & HW Bass (POSTER, 3rd Place Award) Isolation and Characterization of Sorghum BACs for Cytogenetic Mapping of Maize Genome. Tri-Beta Biological Honor Society Second Annual Poster Board Competition; FSU College of Medicine, Tallahassee, FL, November 16, 2006. JD Davis*, GL Koumbaris, DM Figueroa, & HW Bass (POSTER, 4th Place Award) Sequence Analysis of Maize RFLP Markers for in Silico Screening. Tri-Beta Biological Honor Society Second Annual Poster Board Competition; FSU College of Medicine, Tallahassee, FL, November 16, 2006. NC Fredette*, SP Murphy, & HW Bass (POSTER) Mapping a Meiosis-Specific Maize Mutant by Bulked-Segregant Analysis. Tri-Beta Biological Honor Society Second Annual Poster Board Competition; FSU College of Medicine, Tallahassee, FL, Nov. 16, 2006. DM Figueroa, FE (Ina) Amarillo, NC Fredette, AT Morganti, JD Davis, CJ Lawrence, & HW Bass* (POSTER) P349: Constructing A Cytogenetic Map Of The Maize Genome Plant & Animal Genomes XV Conference; San Diego, CA, January 13-17, 2007. FE (Ina) Amarillo* & HW Bass. (TALK) T5: Construction of a Sorghum BAC-based Cytogenetic Map of Maize Pachytene Chromosome 9. 49th Annual Maize Genetics Conference; St. Charles, IL, March 22-25, 2007. DM Figueroa*, FE Amarillo, CE Strobel, CJ Lawrence, & HW Bass. (POSTER) P60: Constructing A Cytogenetic Map Of Maize Core Bin Markers In Oat Addition Lines Using Sorghum BACs As FISH Probes. 49th Annual Maize Genetics Conference; St. Charles, IL, March 22-25, 2007. KD Beckham*, DM Figueroa, FE Amarillo, & HW Bass. (POSTER) Isolation and Characterization of Sorghum BACs for Cytogenetic Mapping of the Maize Genome. FSU Undergraduate Research Symposium, Florida State University, Tallahassee, FL, April 5, 2007. JD Davis*, GL Koumbaris, DM Figueroa, & HW Bass. (POSTER) Analysis of Maize RFLP Markers: Enabling in Silico Screens for Sorghum BAC FISH probes. FSU Undergraduate Research Symposium, Florida State University, Tallahassee, FL, April 5, 2007. NC Fredette*, SP Murphy, & HW Bass. (TALK) Mapping a Meiosis-Specific Mutant by Bulked-Segregant Analysis. FSU Undergraduate Research Symposium, Florida State University, Tallahassee, FL, April 5, 2007. DM Figueroa*, FE Amarillo, KD Beckham, JD Davis, CJ Lawrence, & HW Bass. (POSTER) Constructing A Cytogenetic Map Of Maize In Oat Addition Lines Using Sorghum BACs As FISH Probes. 50th Annual Maize Genetics Conference; Washington, DC, Feb 27 – Mar 2, 2008. NC Fredette*, JD Davis, D. St. Jean, RE Gabriel, AT Morganti, MD Hay, K Graffius-Ashcraft, RJ Hill, J Doster, O Onokpise, & HW Bass. (POSTER) The Maize-10-Maze Project, an Educational Public Chromosome Map Garden Featuring the Magnificent Mutants of Maize. 50th Annual Maize Genetics Conference; Washington, DC, Feb 27 – Mar 2, 2008. JD Davis* DM Figueroa, BC Ring, MS Conejo, FIE Amarillo, CL Strobel, & HW Bass (POSTER) RFLP Full-Length Insert Sequence (RFLP-FLIS) data for use in the cytogenetic map of maize project. 50th Annual Maize Genetics Conference; Washington, DC, Feb 27 – Mar 2, 2008. KD Beckham*, DM Figueroa, CJ Lawrence, & HW Bass (POSTER) Bioinformatic Selection of Syntenic Sorghum BACs with Maize Core Bin Markers for use as FISH Probes in the Development of a Cytogenetic Map of Maize. 50th Annual Maize Genetics Conference; Washington, DC, Feb 27 – Mar 2, 2008. NC Fredette*, AN Brown, & HW Bass (POSTER) Genetic Analysis of Telomere Length Variation in Maize (Zea mays, L.). Beta Beta Beta 2008 Biennial National Convention; Highland Heights, KY, May 28 – 31, 2008. KD Beckham*, DM Figueroa, & HW Bass. (POSTER – 3rd Place, John C. Johnson Award for Excellence in Student Research) Bioinformatic Selection of Sorghum BACs for use as FISH probes in developing a Cytogenetic Map of Maize. Beta Beta Beta 2008 Biennial National Convention; Highland Heights, KY, May 28 – 31, 2008. DM Figueroa*, KD Beckham, JD Davis, CJ Lawrence, & HW Bass. (POSTER) Constructing a Cytogenetic Map Of Maize In Oat Addition Lines Using Sorghum BACs As FISH Probes. 51st Annual Maize Genetics Conference; St. Charles, IL; March 12-15, 2009. The cytogenetic FISH map of maize pachytene-stage chromosomes is produced using maize RFLP marker-selected sorghum BACs as FISH probes. The genetically mapped RFLP markers provide links between the linkage and physical maps of maize. Each locus is mapped by means of multicolor direct FISH with a fluorescently labeled probe mix containing three different FISH probes. They are (1) a whole chromosome paint using knobless maize total DNA, (2) a single sorghum BAC clone, and (3) the centromeric sequence, CentC. Maize-chromosome-addition lines of oat are used as target chromosomes. This allows for strong and clear single-locus FISH signal detection on optically isolated maize pachytene chromosome spreads. The locations of the sorghum BAC FISH signals are determined, and each new cytogenetic locus is assigned a centiMcClintock position based on the short or long arm coordinate system. Using this approach, we find good colinearity between the linkage and cytogenetic maps. We also observe unusually large expanses, regions of genome hyperexpansion, not predicted from the linkage maps alone. This transgenomic cytogenetic FISH map creates anchors between various maps of maize and sorghum and creates additional tools and information for understanding the structure and evolution of the maize genome. The overall scheme for this type if FISH mapping was developed by Koumbaris & Bass (2003). 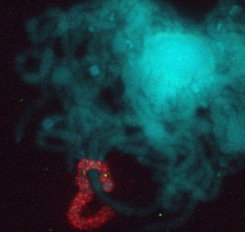 The most detailed cytogenetic mapping to date was done by Amarillo and Bass (2007) for maize chromosome 9. Additional lower density mapping is being completed for other chromosomes and with particular reference to large duplicated segments of the maize genome (Figueroa et al., in progress). 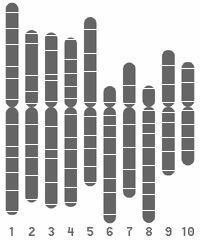 for the maize genetics and genomics database (MaizeGDB). Cytogenetic FISH Map of Chromosome 9 at MaizeGDB. The RFLP Full Length Insert Sequencing (FLIS) Project is an endeavor ancillary to the Cytogenetic Map of Maize Project. The goals of this undertaking are to determine and submit to GenBank a hiqh-quality (both strands) full length insert sequence for maize RFLP markers including the Core Bin Markers (CBMs, ~90 total) and other markers from the UMC 98 map. In addition to being useful for the Cytogenetic Map of Maize Project, these sequences are useful in that they can anchor assemblies of the maize genome to the genetic and cytogenetic maps. 1,312 UMC RFLP PROBES: Tables of Probes, and Loci Detected from the UMC98 map. All of our RFLP_FLIS sequence data deposited in GenBank at NCBI.gov. PlantGDB RFLP-FLIS List at PlantGDB.org. Core Bin Marker (CBM) loci page at MaizeGDB. Final Project Report PDF, submitted to NSF Fall 2009.